The floodwaters may have subsided, but three weeks later, the impacts and damage of Manhattan’s Labor Day floods have lingered with victims. 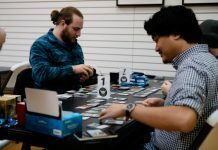 Joseph Wyatt, co-owner of Goblin Games, woke up on the day of the flood to Facebook messages that asked if everything at the store was okay. After checking his phone and not being able to access the store’s downed surveillance equipment, he drove over to see it in person with his business partner, Anne Higley. 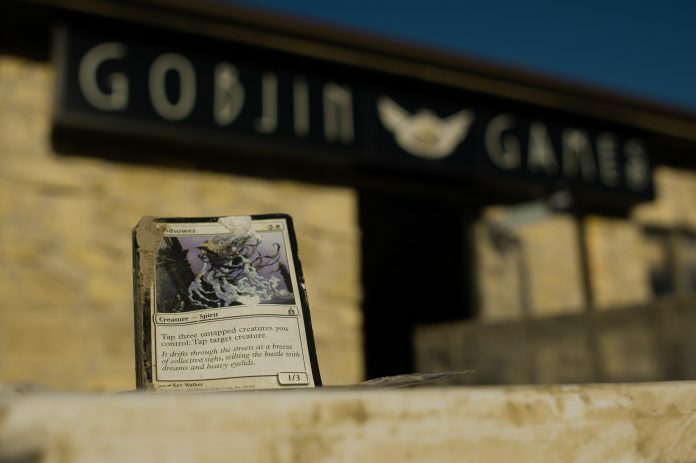 Goblin Games is part of a strip mall that has flooded in the past, but the flooding never affected the gaming store until now. 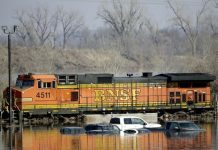 Around 10 a.m., while driving down Seth Child Road, they could see that everything past Linear Trail was covered in water, including the store. Goblin Games had been filled with six feet of water. As the day went on, water levels rapidly lowered. By 3:45 p.m., they were able to enter. They looked to see if anything was salvageable. Some of the board games on the store’s higher shelves and “Magic: The Gathering” cards in double plastic-wrap stayed safe from flood waters. But other than that, everything had been ruined. The next day, the two owners set out to find a new space immediately. Within the afternoon they were contacted by Jeff Sutton, marketing manager for the Manhattan Town Center. He offered them a free space in the mall. By Friday of that week, they were able to reopen. For the independent store, the biggest factor for their revival was the community. The business launched a GoFundMe for the business’s rebuilding efforts, and as of Tuesday, the store has raised $13,505 out of their $20,000 goal — about the same amount of funding they originally had when they first started Goblin Games back in 2015. They held a muddy box sale, giving away figurines with boxes that had been damaged, only asking for donations. Thanks to that, they were able to raise an additional $2,500. The store owners are currently planning on not returning to their previous location and continue to look for properties. For Manhattan resident Michael Reffitt, the worst part of the flood was watching his family home fall apart. The home has been in the family since 1953. Currently Reffitt’s mother Linda Reffitt lives there. It has been a central figure in the family, acting as a gathering place for reunions, holidays and vacations. Located off of Village Street, the home sits next to Wildcat Creek in front of a now-unused railroad foundation. With its large lawn, wooden deck and accompanying pool, its position in the family is visually apparent. But because of previous floods, this home and many others in the area are ineligible for flood insurance. “It’s been in several different floods, but [it has] never ever gotten this high,” Reffitt said. On the morning of the flooding, water filled the Reffitt’s front lawn and home with water. By noon, water still covered the lawn, making Wildcat Creek look more like the Missouri River than a slow, meandering stream. Reffitt said he fears that due to damage, there’s a chance the city might deem it irreparable. This would force them to tear down the home. For Linda, this would have a heavy impact. For now, the family focuses on only one thing: repairing the home. They work together tearing down sheet rock and shoveling the eight inches of dirt out of the basement, bucket by bucket. The lack of insurance and the expectation that the city won’t assist them in repair costs has made the Reffitt family conclude that they are going to have to pay for the repairs out of pocket. The Reffitts said they feel that assistance seems unlikely. Reffitt said that when Linda attended a Red Cross Recovery event, she received a bucket of hardware tools and a $250 debit card. Other than that, no one has reached out to the family offering assistance. 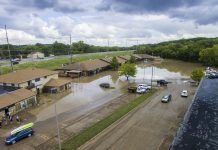 Reffitt expressed frustration with the city for not accepting responsibility for the flooding and blaming homeowners for building in the flood zone. He said he wants the city to look into why places along Wildcat Creek flooded. The city says that only 327 individuals were impacted and 102 homes were destroyed. Local service agencies and nonprofits are working to create long-term recovery funds for those with damaged private property.